If a grand, how long in inches; if an upright, how high in inches? Is your piano long or is it tall? 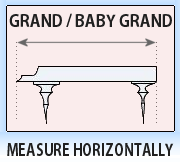 If your piano lies flat usually with three legs, you have a grand or baby grand. From the keyboard to the back, measure its length to the inch, then choose the corresponding size from the dropdown list. If your piano stands upright, it is a virtical piano, also called an "upright." From the top of the piano to the floor, measure its height to the inch, then choose the corresponding size from the dropdown list. We hope that you enjoy the simplicity of our piano restoration pricing calculator. The price quoted is valid for the entire day that you received it and you can count on it! We offer high quality restoration work that is methodical and systematic. We've learned over the past 40 years that the work needed on older pianos is predictable and routine. The work requires a professional hand, but you would be amazed at how little the needed work varies from one piano to the next. If your piano has fire or water damage, additional charges may apply. All pricing must be approved by you. Also, if your piano will be used professionally at a performance level, you may request a more radical re-manufacturing process that will address concert stage performance requirements. Call us; we would be happy to quote a price that you can count on. Thanks for your interest! Substantial discounts apply if you combine our cabinet refinishing service with our interior restoration service. Currently, we are offering a 30% discount if you choose our complete restoration package. We also offer a 10% discount if you complete your order online through our secure shopping cart. Rest assured that your satisfaction is guaranteed. We stand behind our work.